As laptops, flat screens and smart phones grow ever more ubiquitous, so does the problematic trash they ultimately become. It’s a quandary for the Information Age that seldom gets the attention of the cool tech tools themselves. Individual communities in the U.S. have been struggling with how to dispose of electronic waste, who should pay for its recycling and whether companies that manufacture electronics should be responsible for their full life cycle. But much of this e-waste is never disposed of anywhere in the U.S. — whether at local municipal dumps or corporate facilities. It winds up, of all places, in Africa, or the Philippines, where it’s mined for valuable components as small as copper wiring. And conscientious consumers trying to hand off their old electronics seldom realize this. “That’s the infuriating part of this — people who are really trying to do the right thing, who haul their big hulking televisions down to an Earth Day collection event in the neighborhood, people who are going to the trouble of taking their old stuff to some place thinking it’s going to be recycled, have no idea that it’s not going to be recycled at all,” said Barbara Kyle, national coordinator of the Electronics TakeBack Coalition. 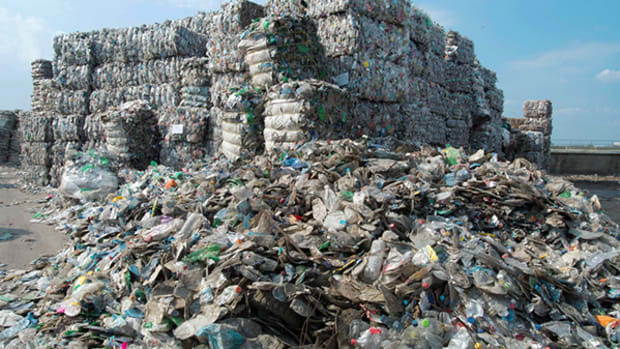 “Recycling” is not really the best word to describe what happens to this material when it arrives in other countries, and its toxic components pose serious environmental and public health hazards there. Currently, nothing about this business is illegal. But legislation introduced last week in Washington aims to finally address the booming trade, banning exports from the U.S. of most electronic waste to the countries least prepared to responsibly process it. Researchers estimate that between 50 and 80 percent of electronic waste from the industrialized world that winds up in the hands of “recyclers” actually goes to a few developing countries: China, India, Pakistan, Vietnam and the Philippines. There, the unregulated materials are crudely handled in acid baths and burn pits, releasing into the air and soil heavy metals and chemicals that are used to make flexible plastics and flame retardants. Studies of individual scrapping facilities in Ghana and China have measured contaminants and toxic metals like lead present in soil at more than 100 times typical background levels. And as more of the world uses electronic products — and as their individual life spans shorten in favor of ever-evolving upgrades — the waste is getting worse. Reports have pegged the global e-waste generated each year at 20-50 million tons. Keeping it in the U.S., according to the bill’s two Democratic sponsors in the House, Gene Green and Mike Thompson, could both curb the harmful health and environmental impacts overseas and create recycling jobs at home. Apple, Hewlett-Packard and Dell, which say they’re already trying to do responsible recycling, support the bill. Those jobs, of course, won’t look here like they do in Ghana. “It would definitely look different than those pictures you see of people burning stuff and stirring the [trash] pile with a stick,” Kyle said. If anything, she hopes as a result of banning exports that the U.S. would develop a more sophisticated recycling industry that’s better able to process problematic technology. This idea, too, is often overlooked: As we build more advanced electronics, we also need more advanced ways of taking them apart. Recycling: A Free Pass for Wasteful Consumption? Environmental Justice Gets a Second Life in Washington, D.C.
After a decade stored away in the basement of the White House, a new commitment to rooting out toxic messes dumped on poor communities has begun.